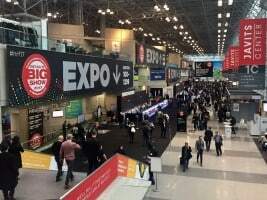 Over 35,000 attendees visited the National Retail Federation’s (NRF) BIG Show in New York City’s Jacob Javits Convention Center January 15-17. For those who have not visited the exhibition hall, it the equivalent in size of all the various loss-prevention-specific shows combined—plus double or more. Several LP suppliers were in attendance, primarily those with products that have application across the retail enterprise. Tyco Retail Solutions (now featuring Sensormatic, TrueVUE and ShopperTrak brands) was showcasing several of their solutions and partnerships with other companies focused on real-time, in-store visibility and predictive analytics. They also were demoing some interesting innovations with traditional LP products, such as a tag that digitally displays pricing or other information that can be dynamically changed as well as an apparel tagging and removal system for self-checkout. While most people know Axis Communications for their cameras, today they think of themselves as “end-to-end” solutions providers with applications built into their cameras. The company exhibited a new audio speaker system that can be used to provide store background music plus announcements about customer service or assistance needed in specific areas based on dwell-time and other analytics built into their cameras. Who knew? CEO Guy Yehiav and the Profitect team were demonstrating their business analytics software. Yehiav, who started Profitect in 2010, also participated in a panel discussion with Seth Hughes of Walgreens and Andrea Weiss of the O’Alliance about retail in relation to Internet of Things (IoT) and machine learning. It’s Yehiav’s opinion that loss prevention can be the “analytics powerhouse” inside the retail enterprise given LP’s analytics expertise. Checkpoint introducing its Wind RFID label optimized for cosmetics and other products. Vy Hoang and the i3 International team discussing their video analytics and upcoming Innovision conference. ClickIt finding a lot of interest in their patented Virtual Line Up recognition system. Malay Kundu showing off upgrades to StopLift’s scan-avoidance incidents at both manned and self-checkouts. Pedro Ramos of Agilence and Stuart Levine of The Zellman Group supporting KWI’s broad retail solutions. Tom Rittman of The Retail Equation discussing their merger with Sysrepublic and acquisition by Apriss. FireKing displaying their many safes and cash managements solutions. Mark Barnes at LNL Systems explaining their smart sales floor LP applications. Read Hayes with University of Florida Professor Betsy Goodman planning her 2017 retail conference. Scott Thomas from Genetec chatting with the Axis team. Former NRF Executive Dan Butler racing to moderate a panel.